Claterbos tells us that Martin Halbkram, in 1871, had a shop at number 10 Kolowratring, was appointed a clock maker to the court in 1891, and died in 1902. The mechanism in this clock, with its two and a half plates, year duration, maintaining power, and lovely crutch, is appropriate for a clockmaker of the Kaiser’s court. One has to wonder where this clock spent the early part of its life, with its gorgeous, and massive case, ornately engraved dial, pendulum, and weight, porcelain cartouche numerals to the dial (in perfect condition), very delicate and elegant hands: This clock clearly made a statement in the late 1800's, proclaiming for all who beheld it: The owner of this clock has clearly made it to the top. The massive Austrian three-plate movement with 4.25 mm thick plates and a two-piece dial is badly tarnished and could use a good cleaning. 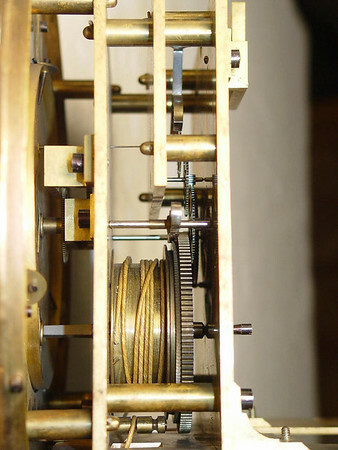 It is unusual to see a three-plate mechanism: In this case it allows the primary train gears to have short, very strong arbors (working between the back two plates) while providing room for a wide winding drum (working between the front and back plates) as needed for a floor-standing clock with its long weight drop and thick weight cord. And, this clock has a pendulum with the indicating dial to the center of the bob, telling you the relative position of the bob in its adjustment. Note the stunning engraving to about every piece of exposed brass, including the dial, pendulum rod, bob, pulley, weight and mechanism mounting brackets: I suspect anything less ornate would be out of the question in a case that makes as strong of a statement as does this one! Note too the stunning carving to the section just below the dial, and the subdued and massive feel to the base and hood. And, thankfully, all of the glass is wavy and original.